Hello guy's Im really interested in NepTune RTP but I want to know the difference betwen S300 and RTP. My car Is All motor and I want to make a good buy. im tryin to find if anybody has NEPTUNE RTP program on their ECU and IF ITS BETTER THAN HONDATA? CAUSE I FOUND IT FOR WAY CHEAPER THAN HONDATA AND AS YOU KNO TIMES ARE HARD!!! SUPPOSELY IS BEST BANG FOR YOUR BUCK!!! THANKS IF YOU HAVE ANY GOOD FEEDBACKS ON THIS!!! I have Neptune RTP and it's a very good tuning system. it can be very comparable to Hondata S300. right now, Neptune is working on the onboard logging. something that S300 has had since day one, but as are far as tuning tools, they are both the same. My tuner sells both but likes to tune S300 over Neptune. I love my neptune, it works for me better than crome for my setup. anti-theft logging/ ignition cut. code inputs through brake and gas pedal. datalog playback without disconnecting from RTP. I was going to provide an updated image from the same source, but it looks like your version just got updated too. It still leaves out some of things mentioned in the post above me. If anyone has any questions about NepTune I'm here on this forum now. It would seem to me that the only plus Neptune has over Hondata is the two extra analogue inputs. I know for some this may be an issue but I know that the PLX systems are extremely compatible with the S300. All of the PLX systems are daisy chain enabled, so your two inputs are more then enough. Just a thought. Edit: I just read the post a couple above me. It does seem that Neptune has some great features to it. But some of those are able to be done with Hondata as well. Take for example the shift light. If you check out the Hondata forums there are several more tips and tricks that are easily setup. They have an MIL Shiftlight feature, but not per gear. 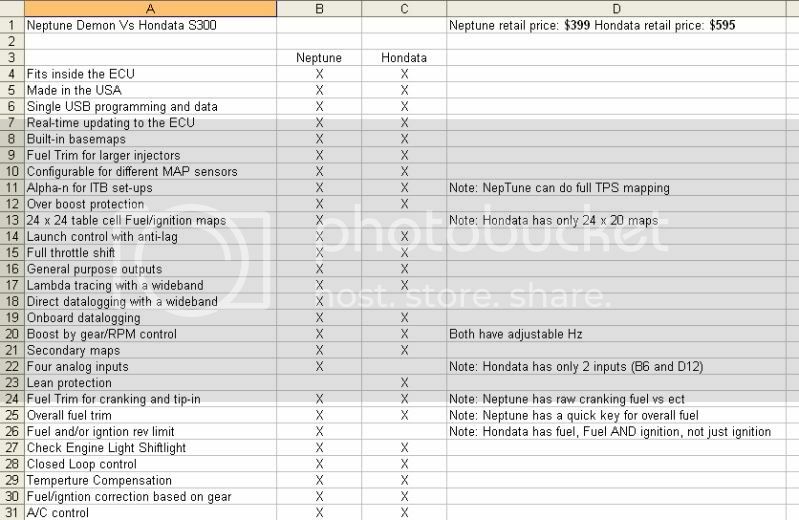 When it comes down to it there's several features NepTune has that Hondata doesn't. And there's several that they both have where NepTune goes further or is more configurable to meet your needs. In the end it's not only about features, it's about what's comfortable to you. All times are GMT. This page was generated at 20:56:47.